How to route the cables through a pipe with multiple bends? Currently, I'm routing by creating different location points wherever the pipe bends. It serves the purpose. But looks very odd and very time taking too. Reworking also very troublesome. 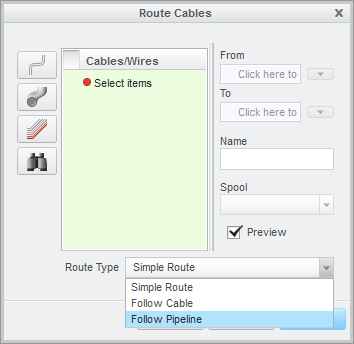 Any easy way to create network and therby cables through it? Please help. Re: How to route the cables through a pipe with multiple bends? I have never routed through a Pipe before, but I would give Follow Pipeline a shot and see if it does what you are after. Further to this, how to offset the routing path from the pipe axis to the exterior of the pipe? In other words, how if I want the wire routing be parallel to the pipe's boundary but not pass through the pipe itself. Also, how can we route the wire/network along (or offset to) a sketch/predefined spline etc?